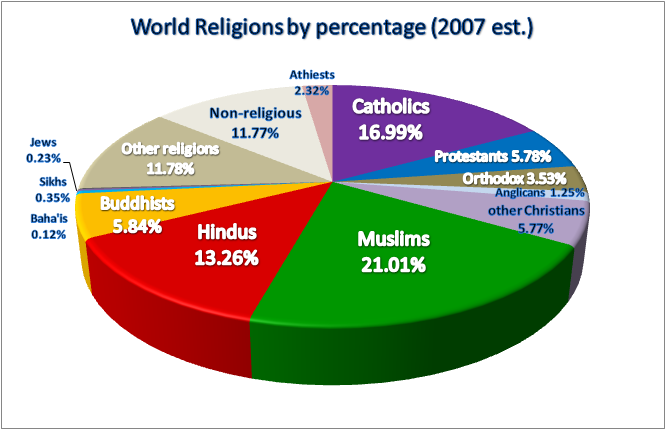 This pie chart is based on statistics listing peoples self-admitted adherence to one of the major world religions, or to other faiths, or to people stating that they are of no religion. As you will see the pie chart only mentions percentages of the world's population whose religiously related self-admission places them in each category. To get a better idea of the numerical population size statistics please consult the following list of the major world religions. This listing of figures hopefully gives a good approximation of the world's populations self-professed adherence to major world religions, other religions, or their self-professed state of not being religious. The above image shows projected possible alterations in the levels of faith adherence in the US. to the Catholic, Protestant, Orthodox and Other divergences within Christianity. Trends in adherence to the major World Religions are probably linked to differing rates by which populations are changing in the World's various regions of "prevailing historical religious beliefs" or of the "marked onset of secularism". Population statistics show relatively rapid increases of overall population in Africa and Asia and relative population decline in Europe. Likewise with secularism which seems to have had a particular onset in Europe. Some truly extra-ordinary wisdoms ~ a brief selection of "Central Spiritual Insights" gleaned from Christian sources closely followed by another brief selection of "Central Spiritual Insights" drawn from "non-Christian" Inter-Faith sources ~ are set out below, (to be again closely followed by what seems to be a comparable selection of "Central Poetry Insights"). These Christian quotations have been selected based on their inherent Spiritual Impact, (rather than whether they might be deemed to be Catholic, Protestant or Orthodox), and come from The New International Version of The Bible and from the 'Of the Imitation of Christ'; a fifteenth century devotional work that has long been the second most widely read Christian book after The Bible itself. Some have Me in their mouths, but little in their hearts. There are others who, being enlightened in their understanding and purified in their affection, always breathe after things eternal, are unwilling to hear of earthly things, and grieve to be subject to the necessities of nature; and such as these perceive what the Spirit of Truth speaketh in them. For it teacheth them to despise the things of the earth and to love heavenly things; to disregard the world, and all the day and night to aspire after heaven. So I tell you this, and insist on it in the Lord, that you must no longer live as the Gentiles do, in the futility of their thinking. They are darkened in their understanding and separated from the life of God because of the ignorance that is in them due to the hardening of their hearts. What we have received is not the spirit of the world, but the Spirit who is from God, so that we may understand what God has freely given us. This is what we speak, not in words taught us by human wisdom but in words taught by the Spirit, explaining spiritual realities with Spirit-taught words. The person without the Spirit does not accept the things that come from the Spirit of God but considers them foolishness, and cannot understand them because they are discerned only through the Spirit. Nor are you to be called 'teacher,' for you have one Teacher, the Christ. The greatest among you will be your servant. For whoever exalts himself will be humbled, and whoever humbles himself will be exalted. Therefore, my beloved brethren, let every man be swift to hear, slow to speak, slow to wrath; for the wrath of man worketh not the righteousness of God. Chuang Tzu put on cotton clothes with patches in them, and arranging his girdle and tying on his shoes, (i.e. to keep them from falling off), went to see the prince of Wei. "How miserable you look, Sir!" Cried the prince. "It is poverty, not misery", replied Chuang Tzu. "A man who has TAO cannot be miserable. Ragged clothes and old boots make poverty, not misery". Sell your cleverness and buy bewilderment; Cleverness is mere opinion, bewilderment intuition. The intelligence of the mean man does not rise beyond bribes and letters of recommendation. His mind is beclouded with trivialities. Yet he would penetrate the mystery of TAO and of creation, and rise to participation in the ONE. The result is that he is confounded by time and space; and that trammelled by objective existences, that he fails apprehension of that age before anything was. But the perfect man, - he carries his mind back to the period before the beginning. Content to rest in the oblivion of nowhere, passing away like flowing water, he is merged in the clear depths of the infinite. He that does everything for Me, whose supreme object I am, who worships Me, being free from attachment and without hatred to any creature, this man, Arjuna!, comes to Me. Bhagavad Gita ~ (Hinduism) ~ also known as ~ (Vedanta). In the Love of My Lord. That is a pious act. The path of the just is as the shining light, that shineth more and more unto the perfect day. The way of the wicked is as darkness: they know not at what they stumble. Would you become a pilgrim on the road of love? The first condition is that you make yourself humble as dust and ashes. Let a man overcome anger by love, let him overcome evil by good; let him overcome the greedy by liberality, the liar by truth! Speak the truth, do not yield to anger; give, if thou art asked for little; by these three steps thou wilt go near the gods.